Extensive testing by a panel of specialists showed how effective this collar can be at supporting the neck during crash tests. Available in black/blue, black/gray and black/red. SPARCO NECK SUPPORT. Make: STAND 21 (Sparco). The all-carbon bodies of these models combine an exclusive resin-transfer technology (RTM process) with a UD monolithic section. That refined monolithic technology has allowed a new design for the unit's arms. 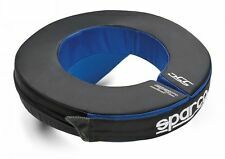 Sparco SPC4004 Neck Support Black, One Size . SPARCO Racing knee pads. Condition is Used, with a small 5p sized hole in one pad. I have other motorsport clothing and memorabilia listed as I am having a clear out! Please see my other auctions for racing boots / nomex / Aston Martin Racing clothing etc.